Will Cheniere Energy Partners Sink or Swim? The master limited partnership’s focus on long-term stability and visible cash-flow growth seems to be a one-in-kind in the fiercely competitive global LNG market. Cheniere Energy (NYSEMKT:LNG) -- through its master limited partnership Cheniere Energy Partners (NYSEMKT:CQP) -- put the United States firmly on the global LNG map when it exported its first LNG cargo to Brazil from its Sabine Pass liquefaction facility. While that's definitely a matter of pride, the real question is: Is Cheniere Energy Partners built to last? Can it flourish in the fiercely competitive global LNG market? Global demand for liquefied natural gas has been slowing down, just as it has been for crude oil, thanks to slowing economic growth across the globe. In the lucrative Asian markets, for example, natural gas prices -- and by default, LNG prices -- are indexed to crude oil prices. 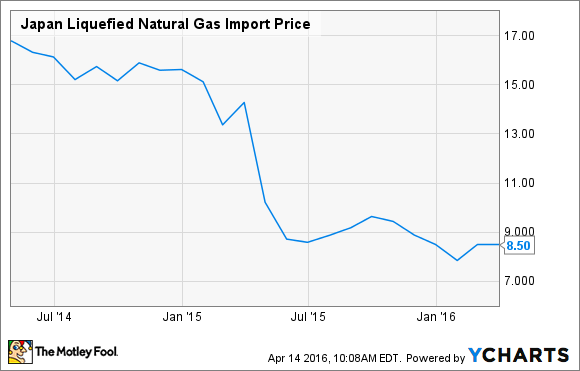 As oil prices tumbled, so did natural gas prices. In February, Asian spot LNG prices fell to $5.98/MMBtu -- from nearly $20/MMBtu in 2014. Below is a table showing how LNG import prices have fallen during the last two years in Japan, a major importer of natural gas. Japan Liquefied Natural Gas Import Price data by YCharts. In addition, mild weather patterns in cold countries ensured that natural-gas demand didn't get to spike, which could've potentially pushed up prices. However, of greater consequence is the medium-term supply situation brewing in the global LNG market. In the face of slowing global LNG demand, vast amounts of capacity in natural-gas liquefaction and export are expected to come online from Australia between 2017 and 2019. While all the pessimism exists at the macro level, Cheniere Energy Partners' highly visible and stable cash-flow growth during the next three years makes it an attractive long-term investment -- especially for income-seeking investors. What projects constitute Cheniere Energy Partners? Unlike its general partner Cheniere Energy, which is betting on multiple projects, the bread and butter of the MLP, Cheniere Energy Partners, is the Sabine Pass Liquefaction facility, or SPL. The other revenue arms are the Creole Trail Pipeline, and the long-existing Sabine Pass regasification unit. Of the three, the Sabine Pass Liquefaction facility -- with six proposed liquefaction trains -- is expected to be the proverbial cash cow. The first train, Sabine 1, commenced commercial exports in late February, while the second train should follow suit in a few months. Of the remaining four, three are actively under construction and are expected to come online between 2017 and 2019. Each train is expected to deliver a massive 4.5 million tonnes per annum, or MTPA, of LNG. The construction of the sixth and final train is yet to receive the green signal via a final investment decision, or FID. What makes the cash flows stable and highly visible? Each of the five liquefaction trains are backed by "take-or-pay" fixed-fee contracts with investment-grade customers. The beauty of fixed-fee contracts is that they makes the MLP's cash flows virtually independent of underlying commodity prices. More importantly, these contracts are locked for a period of 20 years with no price reopeners, or other negotiation clauses that may threaten the long-term visibility of the cash flows. Of the total 22.5 MTPA of LNG that'll be processed in the five liquefaction trains at the Sabine Pass Liquefaction facility, 20 MTPA -- or nearly 89% of the total volumes processed -- are locked through "take-or-pay" contracts. Commercially speaking, there's $2.9 billion in annual fixed-fee revenue for the taking, as described in the following slide. In addition, the customers are reputed and are expected to honor the long-term contracts. Cash flows generated from the two liquefaction trains that would be operational by the end of 2016 will likely not be enough to offset costs incurred until now. However, it would be a different story once the remaining three trains come online by 2019. In other words, Cheniere Energy Partners will, in all probability, struggle to remain cash-flow positive over the next two or three years. However, that shouldn't deter investors, especially dividend investors, from jumping in right now because the long-term cash flow growth visibility is high. Additionally, the MLP refinanced its debt in February, which means no debt obligations are present until 2020. The $2.8 billion debt refinance itself bears testimony that lenders have full faith in Cheniere Energy Partners despite the overall oil and gas industry facing unprecedented headwinds in raising capital.